Near the intersection of N Harbor Drive and Laning Rd. Firearms are nor allowed on the installation. This Park is absolutely awsome if you are equipped to dry camp, and contrary to a previous comment, you would be hard pressed to find a less expensive spot in San Diego, or elsewhere for that matter, (obviously that person has not stayed at many MWR facilities). The location here is fantastic and there is a small beach on the other side of the building, if you have your own kayak or paddleboard, or you can rent them at the office. 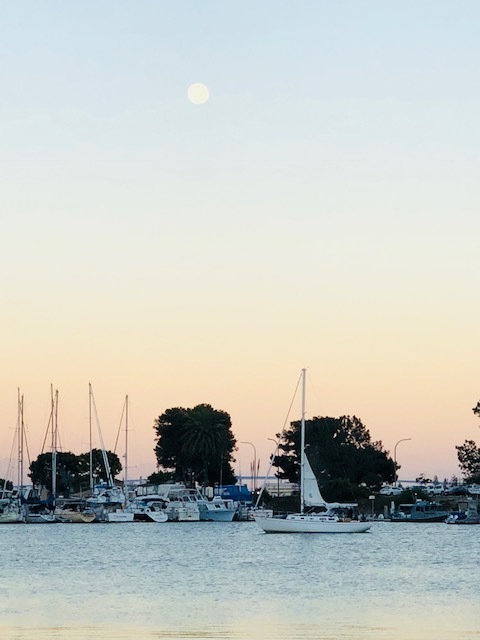 Across Harbor Blvd is Liberty Station with everything you might need for your stay, restaurants, Von's Market, Ace Hardware, even a 9 hole Golf Course. The proximity to downtown San Diego, (4.5 miles), I rode my bike to the Convention Center, and if you're into cycling, you could continue south and loop San Diego Bay, going through National City, Chula Vista, Imperial Beach, go up the Strand and take the Ferry from Coronado to their landing right next to the USS Midway and then back to the Park, (about 35/40 miles). Balboa Park is only 3.5 miles and is another great place to cycle around or spend the day exploring all it has to offer. All in all this location has much to offer and any complaints to the contrary are people being petty. The staff is great and helpful. Hope this helps, safe travels. The campground at Point Loma Naval Station is a parking lot directly on the bay at San Diego with striping to accomodate RVs. These RV sites are all boondocking sites. The views and location don't get much better and the spacing between sites is fairly reasonable. Before you arrive, I would disconnect your towed vehicle before going through the gate. The plastic barricades are too close together which makes arrival on base a challenge. For those who have fifth wheels or travel trailers, just go slow, and be careful through the gate entrance, and you should be okay. If you aren't comfortable, they are plastic barricades and can be moved, but the gate security is often there alone and probably won't be much help. They do have showers and restrooms, but haven't had a code device installed on the exterior doors yet, so they are only available for use during MWR working hours of 9am to 4pm. We stayed for three nights so we didn't have to use a local dump station, but if you do need a dump station, the closest one is at 2540 East Mission Bay Drive about 5 miles away. 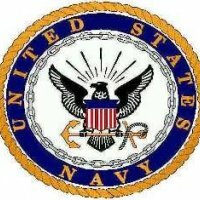 I would definitely visit Cabrillo National Monument which is about 4 miles from this base. The history of this Spanish Explorer is interesting, but the views of the bay and San Diego from this high elevation point leading in to the bay are magnificent. Also, not far is Liberty Station. These are renovated older Navy facilities to new shops, restaurants and a brewery. Nice easy place to shop or eat out, and only a mile or two from the base. 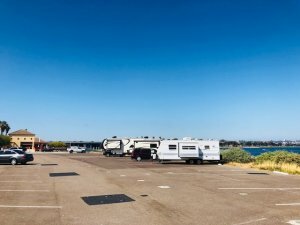 This RV Park deserves all fives, showers are clean, and they clean them every day, they have electric outlets you can plug into, and the staff encourage you to do so. The sites are well maintained, and each site has a view of the Beautiful San Diego Bay, sitting outside and cooking a meal with the view of the bay is AWESOME !!!!! Honestly there is no other place in the area you can camp on base for the small price of this park and have the stunning view in your line of sight. If dumping is a concern “South Shores” a hop skip and jump away you can dump for free. There are no hook-ups but that doesn’t seem to bother me “I use a solar panel to maintain my batteries, and when they get low I just take the rig up the road to South Shores, and that seems to charge my batteries. Doug, Franze, and Dave are very nice people, and if your looking for great customer service “this is definitely the place to be.” The commissary is right up Harbor Blvd or a quick jump on the five off of Grape Street. Same goes for the Larger NEX stores. Or there is Ralph’s or Vons which are both equally as nice. There are also the convenient NEX stores in the area, and on base gas station close by. If Propane is an issue, then there is refill areas less than ten minutes away. Just look up propane on the information highway and you’ll find the local refill points. Also I would like to mention they have some of the best seafood in the area at Point Loma Seafoods, and its a five star. Then there is Mitch’s they have some awesome food. A local said the Avacado toast is what she always gets. It is embellished with crab. There are also fine dining places in the area. This is very secure they have security, and have walking rounds they do every day. I leave my windows open for the breeze and have never had a problem. So, if your looking for a safe place convenient with excellent customer service look no more you’ve found it here. Bottled water no problem they have a Glacier machine at Ralph’s and one on the SWS base a hop skip and jump away. Happy Rving ?. The Harbor lights are stunning at night glistening over the water, and there are always beautiful boats coming through, and the sound of the Seagulls and watching them in flight if you like birds is a happy feeling to wake up to. The San Diego lights with the sun going down over the water is aspiring as well. This is a gem of a location. The RV Park is literally a converted parking lot accessible immediately after you enter the gate. The parking spots back up to the bay. The marina is on site and under remodel. During business hours, you can use the showers and restrooms. Views of the bay are really pretty and there is a small beach on the other side of the marina to launch kayaks, rental or your own. There are no hookups, no dump station, and no potable water. Bring it in and take it out. The lot exit is a bit narrow and needs to be widened for RVs to be able to make that turn without running up on the curb. The price of $20 per night for no hookups, no WiFi, and no water or dump is a bit high, but I’m sure some would argue location. There is a small NEX, but we didn’t go in so I can’t say what they carry. There is a NEX gas station a few blocks out the gate. The old training grounds a few blocks away are being converted into shops and restaurants with an amazing park, playgrounds, and green space with free parking. If they ever put in full hookups, it will get overtaken by residents, there were already a couple of obvious ones there. We enjoyed our stay and will likely return if available.